Diana Puterbaugh faced some skepticism in 1997 when she launched an online hop-sales business to serve craft and home brewers. 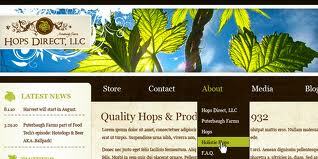 It took a couple of years before her brainchild, Hops Direct LLC, started to see some interest. Now, the operation she owns and operates from the family’s 700-acre farm on Green Valley Road is thriving, selling leaf hops and pellets to buyers around the globe, as far away as Israel. Husband Stacy, 46, oversees the farming operation that also includes apples, grapes, raspberries, corn and pumpkins. Hops Direct is riding a crest of growth in the still-small craft beer segment of the overall beer industry. While less than 10 percent of the market, craft beers sales and volumes are expanding as total beer consumption declines nationwide. The Brewers Association, a Boulder, Colo., trade group for small and independent brewers, reported a 14 percent increase in craft beer sales in the first half of the year compared with 9 percent for the same period last year. A craft brewer produces fewer than 6 million barrels a year.